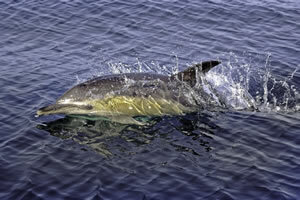 Short-beaked common dolphins are thought of as typically a warmer water species. However, recent evidence suggests they occur in UK waters more regularly now, potentially as a result of rising sea temperatures. 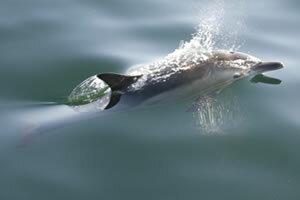 Common dolphins are one of the most numerous offshore cetacean species in the temperate north east Atlantic. 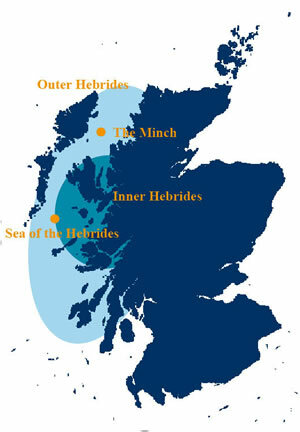 Western Scotland, in particular the Sea of Hebrides and The Minch are important areas for common dolphins. Sightings occur most regularly in the summer months, between May and October. Although recent sightings suggest that they are also present in the Moray Firth throughout the summer months. 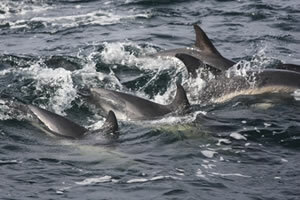 Short-beaked common dolphins have a distinctive hour glass colour pattern on the flank consisting of a yellow or tan patch at the front of the animal and grey a tail stock. The hourglass pattern forms a conspicuous dark ‘V’ shape under the dorsal fin. Animals have a black back, dorsal fin, pectoral fins and fluke and a white belly. The dorsal fin is tall, sickle shaped, centrally placed in the middle of the back. The fin can be uniformly dark or have a pale patch in the centre. Common dolphins have a distinct beak, relatively long and narrow, separated from the melon with a crease. Common dolphins are regularly seen in large groups of hundreds to thousands of animals. They are very fast swimmers, and travel in large groups leaping and splashing out of the water. They are very acrobatic and keen to interact with boats, often bow riding. Common dolphins eat a varied diet of squid and fish, using co-operative feeding strategies to herd fish to the surface in order to catch them more easily. These animals are therefore often seen in association with feeding frenzies of birds. Common dolphins produce high-pitched vocalisations which can, at times, be heard above the surface of the water.